Loyal customers of Lost Creek Vineyards and Winery may have worried about its future when original owners Bob and Carol Hauck decided to retire last year. They needn’t have worried. 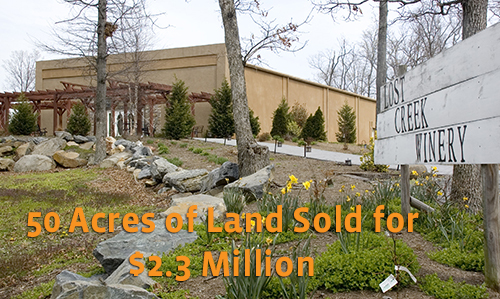 With initial assistance from the Department of Economic Development and a collaborative network of winery operators to support them, Aimee and Todd Henkle of Hampton Road Holdings purchased the Tuscan-style winery for $2.3 million in September 2012. We met with the Henkles early on, to help them consider options for the structures on the property and make suggestions for financing. But what really made this a $2.3 million sale were not our services, or even the acres of grapes, it was the established Lost Creek Winery business. Combine this business with Loudoun County’s strong brand as D.C.’s Wine Country, and our favorable soil conditions, temperate climate, and access to technical experts, mentors and skilled winemakers – they all make this winery a very desirable asset. Lost Creek is one of 42 wineries in Loudoun, which boasts the highest concentration of wineries in Virginia. By purchasing Lost Creek, the Henkles have acquired 50 total acres of land, which includes 21 acres of grapes; a winery with the capacity to produce 7,000 cases per year; two outdoor pavilions which can accommodate up to 100 guests; tasting and banquet facilities; a gazebo and a deluxe residential home. The Henkles have retained the services of wine consultant Sebastien Marquet, and are expanding Lost Creek’s estate varietals to include cabernet franc, and syrah and petit verdot, in addition to offering more traditional Burgundy and Bordeaux winemaking styles.